The VHS cover of Billy and Mandy in Trepanation of the Skull and You. 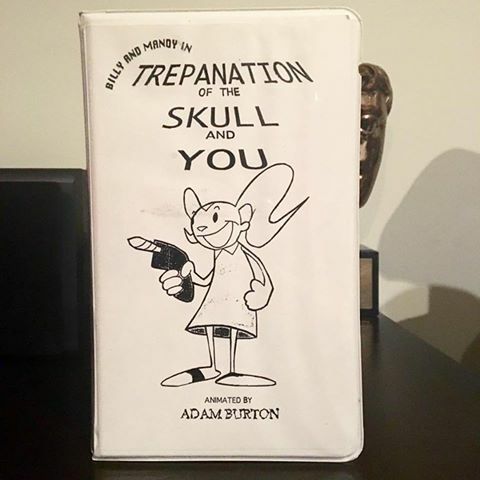 In 1995, while Maxwell Atoms (née Adam Burton) was still in college, he created a short animated film titled Billy and Mandy in Trepanation of the Skull and You. This short would go on to form the basis of Atoms' hit Cartoon Network show The Grim Adventures of Billy & Mandy. The character designs differ quite a bit from the end result. 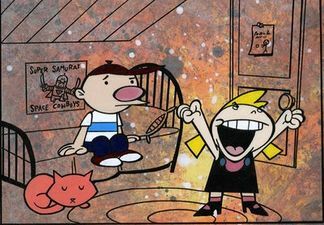 In the original pilot, Billy appears lankier and with a smaller nose than his final design while Mandy has pigtails, a nose (which she lacks in the series), and a plain, single-color dress. 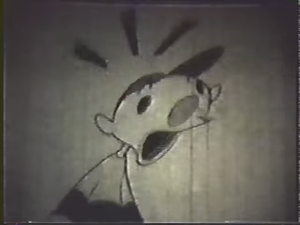 In the short, Billy learns about trepanation, a process in which a hole is drilled into the skull to relieve internal pressure, after seeing that Mandy (who incorrectly describes the process as a way to unlock the brain's full potential) has already gotten "trepanned"; Billy then has Mandy trepanate him, which results in Billy losing copious amounts of blood before passing out. Atoms described it as being "completely inappropriate for Cartoon Network," but felt that the characters were too fun to use only once, which led to the development of the series. 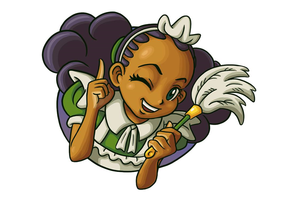 In need of a straight-man character, it was eventually decided to add the Grim Reaper as the third protagonist. 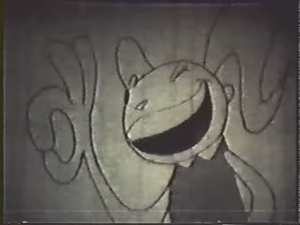 For the longest period of time, it was believed that the short utilized the visual style of a piece of concept art for an unrelated and unmade pilot for the show (shown below); the actual short is stylized after monochrome films of the 1920s and 1930s, and featured only Billy and Mandy, the latter of whom appears significantly different from the below image. Atoms would later clarify the issue on his official YouTube upload of the short. In Atoms' 2013 RebelTaxi interview with Pan-Pizza (of thatfellowinthecoat.com and partner of Channel Frederator), he mentioned the short in some detail, revealing that he had it stored away on film, noting that he should've had it digitally transferred "at some point." On RebelTaxis's Podcast on March 15, It was announced Maxwell Atoms recently found the old short and would display it at the TROMAnimation festival in New York. A day after the short premiered at the TROMAnimation Film Festival, Maxwell Atoms uploaded the short to his YouTube channel in higher quality; there is noticeable deterioration of the film, though it is still in a watchable state. Atoms has clarified that he is unable to reshoot the short and synch it with its audio track, as he was forced to throw out his assets for the short to conserve space when he was living in a studio apartment. An unlockable still test from an unmade project that was never done in Maxwell Adams Senior year found in the 2006 The Grim Adventures of Billy & Mandy video game; this still was initially thought to have come from the pilot short until the latter's release. Billy and Mandy in Trepanation of the Skull and You, uploaded by Maxwell Atoms in higher quality! Billy and Mandy in Trepantation of the Skull and You, as seen at the 2016 TROMAnimation Film Festival; taken from an archive of a live stream from the Festival. RebelTaxi's interview with Maxwell Atoms.